I've opined before about how I think Sala 19 has the best Gambas al Ajillo in town (if you know of better, please tell me!!) I had a chance last week to pop by again when Jenezuela was in town, but life, sometimes she has tricks up her sleeve. Laura mentioned that Boqueria was right down the street--mere steps away. She hopped over there to see if the wait was any shorter. I'd never been but had always been curious, so while I was reluctant to give up my Gambas, I was getting hungry enough to take some chances. Not big chances, but little ones. Laura came back quickly and said if all 5 of us were there, they could seat us in 5 minutes. I could live with those odds. When we walked in the doors, the same hostess who quoted us the '5 minutes' directed us to a table at the bar where we could buy drinks until our table opened up. 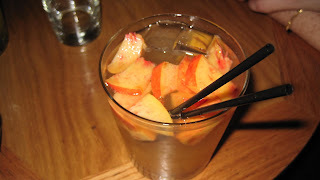 I ordered a glass of the special that night: peach sangria. At 10 dollars a glass (yipes!) I figured it had better be awesome. It was. What was NOT awesome, however, was the 25-minute wait that followed. At one point, we saw a party of 4 (which I assume had reservations) show up at 725, saying "Sorry we're late." At this point, Jen's mom (who's hardly the brassy, rude type) walked up to the hostess and asked again how long it might be until our table came. She said "I can't give you a timeline, and I'm not going to rush people." Correct me if I'm wrong, dear readers, but wouldn't '5 minutes' qualify AS A TIMELINE? Ugh..I'm feeling ranty again. Jen's mom went on to mention that we'd left a restaurant 2 doors down where we had our names on the list--was the wait going to be so long that we should just go back? The hostess replied "You're certainly free to do so." THAT is the point where I wanted to slap a 10 dollar bill on the table and leave. Why must I surround myself with such diplomatic people??? Here's the thing, Boqueria...we're in a recession, and that means I have hardly gone out at all this year. When I do, it had better count. And what I do NOT want is some flippant response from a hostess who's supposed to be giving a good first impression to potential customers. GAH. That really put a sour note on the evening for me. Lucky for Boqueria, their blistered peppers tossed in olive oil and sea salt were tasty enough to make me stop kvetching for about two seconds. Their gambas al ajillo, however, were disappointing for sure. My crankiness wasn't only to blame: the garlic wasn't strong enough, the shrimp were tiny and tasteless, and the dish just didn't hold a candle to the one at Sala 19. There. I said it. And now, days later, when my horror at the hostess's lack of tact has subsided, I stand by it. They just weren't that good. The peppers? Phenomenal. Gambas? El Meh. Seeing as I was the most outraged of the group, I tried to tuck away my outrage for the sake of the evening. 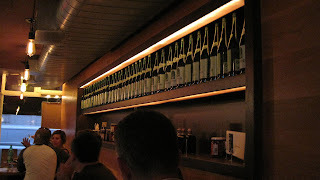 We were (eventually) seated in a corner table. Our server was great. She was attentive when we explained Jen's mom's egg allergy, she checked in on us, and she didn't walk away while we were still talking (something I've noticed a lot lately with servers--weird!). She was just great. A delightful counterbalance to Snippy McSnipperson at the front of the house. We tried the chorizo and manchego cheese plate. It came with six or seven TINY dice-sized pieces of manchego, a decent serving of salty and satisfying chorizo, and assorted dried fruits, nuts. The manchego portion was almost laughable, but whaddya gonna do? I couldn't help comparing this place to Sala 19, and feeling that we got much more bang for the buck at the other place. We also ordered the bacon-wrapped dates (which had slivered almonds inside--not a necessary touch to me, but still okay) along with albondigas (I'll figure out later how to put the accent over the 'o' in albondigas), which were meatballs made from lamb. These were tasty, and came plenty of the delicious sauce. The portions were VERY small, but the server was on top of it all, quick to let us know which ones would not be enough for our group of 5, and tacking on extra portions (for which we were charged, but I'm fine with that--at least there was enough for everyone! )as needed. We also ordered another batch of those blistered peppers because hello, nurse, they were OUTTA SIGHT. 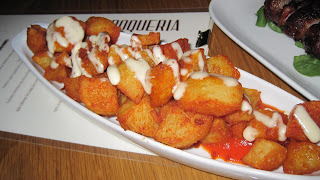 We also got the must-try dish: patatas bravas. They're fried pieces of potato with a Tabasco-y sauce on top and a cooling swirl of cheese. YUM. Xunta, on 1st ave, has the best ones in town in my humble opinion, but these weren't too shabby, either. The portion on this was a bit bigger, and we ordered two of them. Know what we DIDN'T order again? The Gambas. 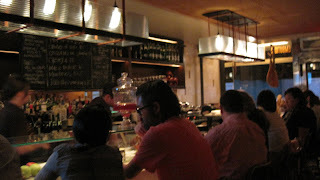 :) To sum it up, I'd go back for the peach sangria and the blistered peppers, but I'd only come in if I had immediate seating at the bar...and it's gonna be a while before I pass up Boqueria for Sala 19 again. A lonnnng while. Yipes! I'm outraged by the hostess' tone...and that you all didn't 1) pay and 2) bring her manager into it. In this recession, they're lucky to have people willing to wait. I think even at Burrito Bar your table would have received an apology and a free app for that redonk!